Harry Potter doesn’t really need to recruit audiences anymore. When you get to the first installment of a two-part ending for a seven book/film franchise it’s fair to say that people have had more than enough time to know whether or not they’re fans of the boy’s wizardry ways. As someone who doesn’t have a particularly vested interest in the franchise I won’t speculate too much on the content of the latest installment, but if you do want to read about that I’d recommend you head over both Cinema Autopsy and Philmology where Thomas Caldwell and Josh Nelson (respectively) have written intelligent, informative reviews of the film. 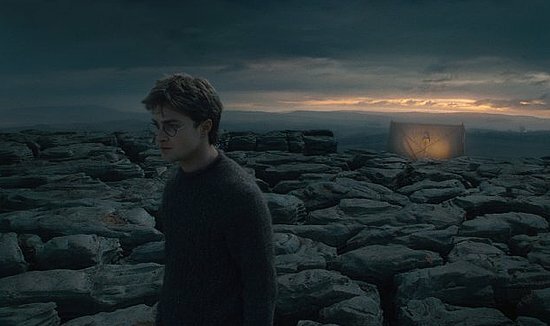 Following Warner Bros’ announcement in early October that Harry Potter and the Deathly Hallows: Part 1 would not be presented in 3D as “they will not have a completed 3D version of the film within the release date window”, I wondered whether or not the sections of the film intended to maximize use of the 3D would seem silly or out-of-place in its 2D counterpart. With this in mind, I went into the IMAX Melbourne Museum looking for missed 3D opportunities and considering its effect on the presented film as a whole. Melbourne’s IMAX museum has the third largest IMAX screen in the world. Seeing a film in that auditorium is as a result far more visually and even experientially impressive than a trip to your local multiplex. Furthermore, much like Melbourne’s Astor Theatre, when you go to the IMAX you are always watching film and not some digital file with flatter, lower resolution and poorer colour and sound quality. Further to this, there is a much smaller chance that something will go wrong in the projection booth because 1) film is a more reliable and predictable format and 2) it is a single screen cinema which means it is constantly monitored by a fully trained film projectionist. Taking these points into consideration, the IMAX made for the perfect environment to notice what was missing in terms of the abandoned 3D. One of the problems in shooting a film for 3D conversion rather than shooting it in 3D in the first instance is that it lends itself to the gimmicky, ephemeral use of the medium. Shooting a film in 3D (as, by way of example, is most often the case with the IMAX natural history documentaries) affords the film with a cohesive depth of field whereas conversion tends often to add a layer rather than a dimension to an image that already exists (it is a matter of perception and some viewers less versed in 3D may not always notice the difference, but there is one.) Moreover, the gimmicky “coming out of the image” that you see with so much popular fare is actually a little counter-intuitive as it detracts from the “immersive” intent of the technology. 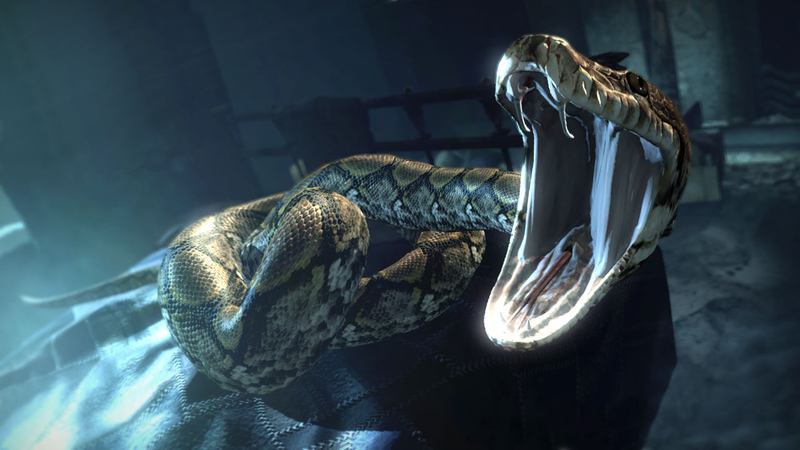 In Deathly Hallows there are two types of images that the filmmakers most likely thought would “benefit” from the technology: the ones where things do indeed come out at the audience (most notably here a snake, pictured above left) and the ones where the environment is supposed to reflect the mental and emotional states of its protagonists, by which I mean the shots of the cold, empty English countryside which I have no doubt would have felt even more barren and endless with the added depth of field. Further to this, elements informed by physics like the ‘dirigible plums’ would have been afforded with a more fitting spatial and gravitational visual rendering and the fast-paced chase sequence at the film’s beginning would too have had far more haptic effect with the layering of a third dimension. There is also an animated story-telling sequence in the film that would have been fascinating in 3D. As it stands the imagery is already losing a dimension to its very form and as such feels a little displaced amidst the narrative. Adding a third dimension to a flat image of shadow puppetry would have given the sequence another layer which, as a story being re-told through an imaginative visual would certainly have added to the acknowledgment of the “problems of history” critical concern that necessarily comes with retelling and reimagining mythological folk-lore. Its relationship to its origins would then have been at yet another level of remove which, in the pursuit of historical truth (something the quest narrative is always concerned with) is not only significant but poignantly so. Taking these points into consideration how then does Harry Potter and the Deathly Hallows hold up in 2D? I’d say surprisingly well. For me, whether it’s 2D or 3D there is something to be said for “the IMAX experience”. The very dimensions of the screen along with its slight curvature and the perfect incline of seating in the auditorium mean that the viewer is always positioned in such a way that optimizes dimensional perception. If you are going to see Deathly Hallows (and be honest, you already know whether or not you are) do yourself a favour and see it at the IMAX. Harry Potter and the Deathly Hallows is released in Australian cinemas and is playing at the Melbourne Museum IMAX from Thursday November 18.